The Black Hawk War was a brief conflict between the United States and Native Americans led by Black Hawk, a Sauk leader. The war erupted soon after Black Hawk and a group of Sauks, Meskwakis, and Kickapoos, known as the "British Band", crossed the Mississippi River, into the U.S. state of Illinois, from Iowa Indian Territory in April 1832. Black Hawk's motives were ambiguous, but he was apparently hoping to avoid bloodshed while resettling on tribal land that had been ceded to the United States in the disputed 1804 Treaty of St. Louis. U.S. officials, convinced that the British Band was hostile, mobilized a frontier militia and opened fire on a delegation from the Native Americans on May 14, 1832. Black Hawk responded by successfully attacking the militia at the Battle of Stillman's Run. He led his band to a secure location in what is now southern Wisconsin and was pursued by U.S. forces. Meanwhile, other Native Americans conducted raids against forts and settlements largely unprotected with the absence of U.S. troops. Some Ho-Chunk and Potawatomi warriors with grievances against European-Americans took part in these raids, although most tribe members tried to avoid the conflict. 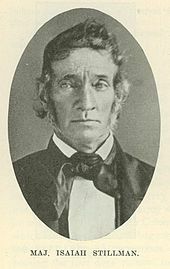 The Menominee and Dakota tribes, already at odds with the Sauks and Meskwakis, supported the U.S.
Commanded by General Henry Atkinson, the U.S. troops tracked the British Band. Militia under Colonel Henry Dodge caught up with the British Band on July 21 and defeated them at the Battle of Wisconsin Heights. Black Hawk's band was weakened by hunger, death, and desertion and many native survivors retreated towards the Mississippi. On August 2, U.S. soldiers attacked the remnants of the British Band at the Battle of Bad Axe, killing many or capturing most who remained alive. Black Hawk and other leaders escaped, but later surrendered and were imprisoned for a year. The Black Hawk War gave the young captain Abraham Lincoln his brief military service, although he never participated in a battle. Other participants who later became famous included Winfield Scott, Zachary Taylor, and Jefferson Davis. The war gave impetus to the U.S. policy of Indian removal, in which Native American tribes were pressured to sell their lands and move west of the Mississippi River and stay there. 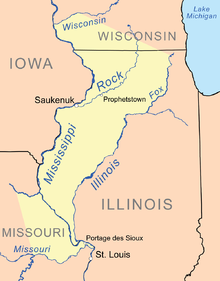 In the 18th century, the Sauk and Meskwaki (or Fox) Native American tribes lived along the Mississippi River in what are now the U.S. states of Illinois and Iowa. The two tribes had become closely connected after having been displaced from the Great Lakes region in conflicts with New France and other Native American tribes, particularly after the so-called Fox Wars ended in the 1730s. By the time of the Black Hawk War, the population of the two tribes was about 6,000 people. Although the return of Black Hawk's band worried U.S. officials, they were at the time more concerned about the possibility of a war among the Native American tribes in the region. Most accounts of the Black Hawk War focus on the conflict between Black Hawk and the United States, but historian John Hall argues that this overlooks the perspective of many Native American participants. According to Hall, "the Black Hawk War also involved an intertribal conflict that had smoldered for decades". 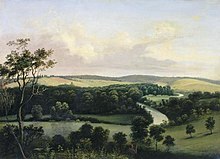 Tribes along the Upper Mississippi had long fought for control of diminishing hunting grounds, and the Black Hawk War provided an opportunity for some Natives to resume a war that had nothing to do with Black Hawk. After having displaced the British as the dominant outside power following the War of 1812, the United States had assumed the role of mediator in intertribal disputes. Before the Black Hawk War, U.S. policy discouraged intertribal warfare. This was not strictly for humanitarian reasons: intertribal warfare made it more difficult for the United States to acquire Indian land and move the tribes to the West, a policy known as Indian removal, which had become the primary goal by the late 1820s. U.S. efforts at mediation included multi-tribal treaty councils at Prairie du Chien in 1825 and 1830, in which tribal boundaries were drawn. Native Americans sometimes resented American mediation, especially young men, for whom warfare was an important avenue of social advancement. Most Potawatomis wanted to remain neutral in the conflict, but found it difficult to do so. Many white settlers, recalling the Fort Dearborn massacre of 1812, distrusted the Potawatomis and assumed that they would join Black Hawk's uprising. Potawatomi leaders worried that the tribe as a whole would be punished if any Potawatomis supported Black Hawk. At a council outside Chicago on May 1, 1832, Potawatomi leaders including Billy Caldwell "passed a resolution declaring any Potawatomi who supported Black Hawk a traitor to his tribe". 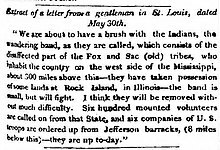 In mid May, Potawatomi chiefs Shabonna and Waubonsie told Black Hawk that neither they nor the British would come to his aid. Without British supplies, adequate provisions, or Native allies, Black Hawk realized that his band was in serious trouble. By some accounts, he was ready to negotiate with Atkinson to end the crisis, but an ill-fated encounter with Illinois militiamen would end all possibility of a peaceful resolution. The Ho-Chunks and Potawatomis, who took part in the war, were sometimes, motivated by grievances, not directly related to Black Hawk's objectives. One such incident was the Indian Creek massacre. In the spring of 1832, Potawatomis living along Indian Creek were upset that a settler named William Davis had dammed the creek, preventing fish from reaching their village. Davis ignored the protests, and assaulted a Potawatomi man who tried to dismantle the dam. The Black Hawk War provided the Indian Creek Potawatomis with an opportunity for revenge. On May 21, about fifty Potawatomis and three Sauks from the British Band attacked Davis's settlement, killing, scalping, and mutilating fifteen men, women, and children. Two teenage girls from the settlement were kidnapped and taken to Black Hawk's camp. A Ho-Chunk chief named White Crow negotiated their release two weeks later. Like other Rock River Ho-Chunks, White Crow was trying to placate the Americans while clandestinely aiding the British Band. The Americans, however, had no intentions of letting the British Band escape. The Warrior, a steamboat outfitted with an artillery piece, patrolled the Mississippi River, while American-allied Dakotas, Menominees, and Ho-Chunks watched the banks. On August 1, the Warrior arrived at the mouth of the Bad Axe River, where the Dakotas told the Americans that they would find Black Hawk's people. Black Hawk raised a white flag in an attempt to surrender, but his intentions may have been garbled in translation. The Americans, in no mood to accept a surrender anyway, thought that the Indians were using the white flag to set an ambush. When they became certain that the Natives on land were the British Band, they opened fire. Twenty-three Natives were killed in the exchange of gunfire, while just one soldier on the Warrior was injured. The Black Hawk War resulted in the deaths of 77 white settlers, militiamen, and regular soldiers. This figure does not include the deaths from cholera suffered by the relief force under General Winfield Scott. Estimates of how many members of the British Band died during the conflict range from about 450 to 600, or about half of the 1,100 people who entered Illinois with Black Hawk in 1832. A number of American men with political ambitions fought in the Black Hawk War. At least seven future U.S. Senators took part, as did four future Illinois governors; future governors of Michigan, Nebraska, and the Wisconsin Territory; and one future U.S. president. The Black Hawk War demonstrated to American officials the need for mounted troops to fight a mounted foe. During the war, the U.S. Army did not have cavalry; the only mounted soldiers were part-time volunteers. After the war, Congress created the Mounted Ranger Battalion under the command of Henry Dodge, which was expanded to the 1st Cavalry Regiment in 1833. 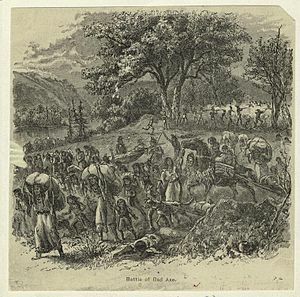 After the Battle of Bad Axe, Black Hawk, Wabokieshiek, and their followers traveled northeast to seek refuge with the Ojibwes. American officials offered a reward of $100 and forty horses for Black Hawk's capture. While camping near present-day Tomah, Wisconsin, Black Hawk's party was seen by a passing Ho-Chunk man, who alerted his village chief. The village council sent a delegation to Black Hawk's camp and convinced him to surrender to the Americans. On August 27, 1832, Black Hawk and Wabokieshiek surrendered at Prairie du Chien to Indian agent Joseph Street. Colonel Zachary Taylor took custody of the prisoners, and sent them by steamboat to Jefferson Barracks, escorted by Lieutenants Jefferson Davis and Robert Anderson. The Black Hawk War marked the end of Native armed resistance to U.S. expansion in the Old Northwest The war provided an opportunity for American officials such as Andrew Jackson, Lewis Cass, and John Reynolds to compel Native American tribes to sell their lands east of the Mississippi River and move to the West, a policy known as Indian removal. Officials conducted a number of treaties after the war to purchase the remaining Native American land claims in the Old Northwest. The Dakotas and Menominees, who won approval from American officials for their role in the war, largely avoided postwar removal pressure until later decades. ^ a b c d Jung, 172. ^ "Understanding the war between the States - Chapter 24" (PDF). ^ Hall, 21–26; Jung, 13–14; Trask, 29. ^ Jung, 14; Trask, 64. ^ Trask, 70; Jung, 52–53. ^ Jung, 54–55; Nichols, 78. ^ a b Jung, 56. ^ Jung, 53; Trask, 73. ^ Hall, 90; Trask, 71. ^ Hall, 90, 127; Jung, 56. ^ Eby, 88; Jung, 62. ^ Eby, 88–89; Jung, 63; Trask, 102. ^ Jung, 64; Trask, 105. ^ a b Jung, 66. ^ Jung, 69; Hall, 116. ^ Dowd, 193; Hall, 110. ^ Jung, 74; Hall, 116; Trask, 145, gives a more general date of "probably April 6". ^ Jung, 74–75; Trask, 145. ^ Trask, 149–50; Hall, 129–30. ^ Jung, 73; Trask, 146–47. ^ Hall, 110; Jung, 73. ^ Eby, 35; Jung, 74–75. ^ Jung 50, 70; Hall, 99–100. ^ Hall, 55, 95; Buckley, 165. ^ Buckley, 172–75; Hall, 77–78, 100–02. ^ Hall, 9, 24, 55, 237. ^ Hall, 103–04. Eby, 79, echoed the argument. ^ Jung, 49; Hall, 111. ^ Hall, 115; Jung, 49–50. ^ Hall, 115; Jung, 70. ^ Hall, 115; Jung, 71–72; Trask, 143. ^ Hall, 117; Jung, 75. ^ Jung, 76; Trask, 158–59. ^ Jung, 79–80; Trask, 174. ^ Jung, 76–77; Nichols, 117–18. ^ Hall, 122–23; Jung, 78–79. ^ Jung, 86–87; Edmunds, 236. ^ Jung, 83–84; Nichols, 120; Trask, 180–81. ^ a b Jung, 84. ^ Jung, 88; Trask, 183. ^ Jung, 88–89; Trask, 186. ^ Jung, 89; Hall, 133–34. ^ Edmunds, 237; Trask, 200; Jung, 95. ^ Jung, 95; Trask, 198. ^ Jung, 97; Trask, 198–99. ^ Jung, 95; Trask, 202. ^ Jung, 96; Trask, 215. ^ Trask, 200–06; Jung, 97. ^ Edmunds, 238; Jung, 103. ^ Jung, 100; Trask, 196. ^ Jung, 101; Trask, 196–97. ^ Hall, 148; Jung 104. ^ Hall, 162–63; Jung, 105. ^ Jung, 109–10; Trask, 233–34. ^ Jung, 110; Trask, 234–37. ^ Jung, 112; Trask, 220–21. ^ Jung, 112; Trask, 220. ^ a b Trask, 222. ^ Jung, 118; Trask, 272. ^ Jung, 140–41; Trask, 271–75. ^ Jung, 141; Trask, 276. ^ Edmunds, 239; Hall, 244–49. ^ Jung, 156; Trask, 260–61. ^ Lewis, James. "The Black Hawk War of 1832". Abraham Lincoln Digitization Project. Northern Illinois University. p. 2c. Archived from the original on 2009-08-15. Retrieved 2009-08-22. ^ Jung, 161; Trask, 268. ^ Jung, 162; Trask, 270–71. ^ Nichols, 131; Trask, 266. ^ Jung, 164–65; Hall, 194. ^ Jung, 165; Nichols, 133. ^ Jung, 166; Trask, 279. ^ Jung, 166; Nichols, 133. Jung says "about 60 people" left with Black Hawk; Nichols, 135, estimated "perhaps forty". ^ a b Jung, 169. ^ Jung, 180–81; Trask, 282. ^ Trask, 286–87; Jung, 170–71. ^ Jung, 171–72; Hall, 196. ^ Jung, 175; Hall, 201. ^ Jung, 177; Hall, 210–11. ^ Lewis, James. "The Black Hawk War of 1832". Abraham Lincoln Historical Digitization Project. Northern Illinois University. p. 2d. Archived from the original on 2009-06-19. Retrieved 2009-08-11. ^ Jung, 182; Trask, 294–95. ^ Trask, 298; Jung, 192. ^ Jung, 192; Trask, 298. ^ Nichols, 147; Trask, 298. ^ Jung, 191; Nichols, 148; Trask, 300. ^ Jung, 195–97; Nichols, 148–49; Trask, 300–01. ^ Trask, 301–02; Jung, 197. ^ Buckley, 210; Hall, 255; Jung, 208. ^ Hall, 212–13; Jung, 285–86. ^ Jung, 49; Buckley, 203. ^ a b Jung, 186. ^ Trask, 304; Jung, 187. ^ Edmunds, 238; Hall, 208, 215. ^ Edmunds, 247–48; Hall, 231. Eby, Cecil. "That Disgraceful Affair", The Black Hawk War. New York: Norton, 1973. ISBN 0-393-05484-5. Nichols, Roger L. Warrior Nations: The United States and Indian Peoples. Norman, OK: University of Oklahoma Press, 2013. George Peacock diary, MSS 1228, at L. Tom Perry Special Collections, Harold B. Lee Library, Brigham Young University. Includes Peacock's recollection of incidents from the Black Hawk War.